Seven children were killed on July 5 when a rocket fired by Iran-backed Houthi rebels struck a residential area in Marib, Yemen. The Katyusha rocket hit a courtyard where the children were playing, said Abdel Ghani Shaalan, Marib’s deputy regional director of security. Two other rockets hit a house and a shop front, wounding 25 civilians including women and children, Shaalan told AFP. Sanctions relief has enabled Iran to further its funding of Houthi rebels in Yemen. Iran has used millions in cash freed up by sanctions relief after the nuclear deal with world powers to further fund its terror proxies including the Houthis and Hizbullah. 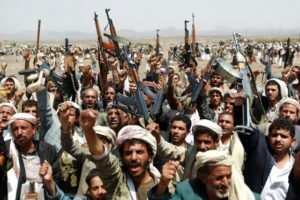 Marib city and the majority of the surrounding province are held by government forces who are battling to drive the Houthis out of areas they control in the north and west of the oil-rich region. Meanwhile, at least six Yemeni troops were killed on July 6 in an attack on a military base near the international airport of Yemen’s southern city of Aden, security sources said. The attack began when two suicide bombers blew up their cars, followed by armed militants storming the Solaban base. They occupied several buildings but were killed after four hours of heavy gun battles, the sources said, adding that 20 jihadists were killed in the attack. There was no immediate claim of responsibility but Islamic State of Iraq and Levant (ISIL) carried out a similar large-scale attack in the southern Yemeni port of Mukalla on June 27.